Why take your family on Safari? The world is changing at a dramatic pace due to the growth of technology. It does make our lives easier, we learn faster and it brings the world closer. However, the only thing that is drifting further apart, are our families. As adults we can chose what is right and wrong, and have a greater need for technology as it is what grows our economy, but as children, they do not know what is right or wrong because they do what they see around them. It is time to take them out of this environment and surround them with nature and reconnect with your children. The “real signal strength” is very strong out in the African bush and the communication between you and your family is clearer than ever. There is every element of a good person on safari, patience, fun, excitement, appreciation, beauty, skill, colour, simplicity and humbleness. One experiences all of these, therefore exposing and surrounding your child to the good qualities of what makes us real people. After travelling to hundreds of various lodges over 20 years, we know which establishments accept your child with open arms, keep them busy, entertained, educated and loved. It is a wholesome experience that we should all be doing more of and that has no down sides. 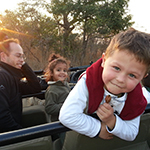 You will have a private vehicle and guide which allows you to adapt your game drive around the interests and patience levels of your children. A family or inter-leading room keeps you close together. Baking cookies in the kitchen with the chef behind the scenes, painting murals, kiddies walks and bush quests are just a few ways in which these amazing child friendly lodges and Africa Direct make this an unforgettable family experience. Let us help you water and feed what is so important to us all and help you plan a safari with you and your family. This article is a general information sheet and should not be used or relied on as legal or other professional advice. No liability can be accepted for any errors or omissions nor for any loss or damage arising from reliance upon any information herein. Always contact your Travel adviser for specific and detailed advice. Tintswalo Safari Lodge is an exclusive 5-star safari lodge under traditional grassing, situated on the Private Manyeleti Game Reserve concession within the Greater Kruger National Park in Mpumalanga. Tintswalo Safari Lodge is situated along a seasonal river bed among an ancient sycamore tree grove, and big five game viewing offer clients the ultimate luxury safari experience. The six spacious and sumptuous suites all have private decks and a plunge pool, and overlook a waterhole frequented by variations of wildlife. Each suite is also authentically decorated to recall the pioneering times of the nineteenth century African explorers they are named for. The mostly untouched reserve; shares unfenced borders the Kruger National Park to the east, the Timbavati Private Nature Reserve on the north, and the Sabi Sand Reserve on the south. Each of these areas is renowned in their own right for excellent safari and wildlife experiences and there is almost no other area like it left in South Africa. Of the entire 22 000 hectares that comprises this luxury lodge, there is only one other concession owner on the property. The Reserve is easily accessible via scheduled daily flights from Johannesburg, via road, and via private charter. There is a mood for all seasons, however, I personally think that winters’ mood is paired best with the African bush. The smell of the dust in the air after a herd of a thousand buffalo passes through the grasslands, the cold bite on your nose as you travel in an open topped game viewing vehicle and the prospect of the day being full of activity because of the suitable temperatures. The summer months have their attraction too with the colourful flowers, the vibrant green of the tree canopy, the dramatic thunderstorms and the obvious presence of new life in every form. 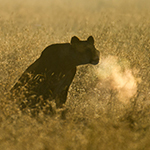 But the privilege of witnessing the wild in full swing comes at a cost: early mornings and late nights with the added pressure of working against the wrath of the African sun. If you are willing to take on the challenges of summer, you will be rewarded with many life changing experiences. Winter is the easier way out and has just as many rewards but in a different way. The mornings are bitterly cold and the colour has disappeared from the flora exposing the harshness of an African winter with no rain, but, the grass has lay down to die opening up the wilderness, the canopy has lost its leaves and the leopards hoisted kill has no longer any cover. The rivers have stopped flowing and all that is left are a few waterholes where all must descend to drink. Because the days are short, we suggest you have a breakfast at the lodge before departing on game drive so that one does not put any pressure on the kitchen in the event of you stumbling across an amazing sighting on the way home causing you to be late. The second step is to arrange the night before for a picnic lunch that you will take with you after breakfast. This allows you to stay out there if you don’t want to come back. The biggest reason for this is during the winter, as mentioned before, is that the waterholes are the last standing options for the animals to drink and one can park at a waterhole after the morning activities and watch the animals gather to drink whilst enjoying your picnic lunch from the vehicle…best restaurant in the world! Once the parade has dissipated back into the bush, it is almost 14:00. A short leg stretch and a comfort break away from the waterhole as to not disturb any late arrivals, and you are ready for chapter two. It starts to get dark and cold around 18:00 so we start to head back as the activities throughout winter are primarily during the day because of the extreme cold at night. Returning to the lodge to a large fire and a beautiful meal is reward for a full day out in the field. An early night provides good rest for another full day of trekking, exploring and sightseeing. Although winter is around the corner and you should be here, I also encourage you to experience all 4 seasons with us in the African bush as they all have the most incredible stories to tell.